Jim Murphy says Scottish Labour would stop onshore fracking from taking place until safeguards are in place. 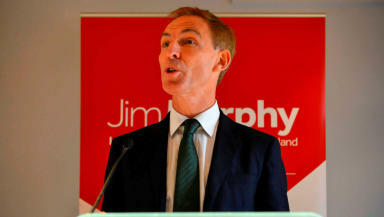 Scottish Labour would stop onshore fracking in Scotland until safeguards are in place, party leader Jim Murphy has said. Mr Murphy said the environmental and safety case for the use of the controversial technique for mining shale gas has not been made. He said a Scottish Labour Government would use new powers over fracking to halt the practice north of the border. Scottish Labour would introduce a "triple-lock system", Mr Murphy said, involving a local referendum before final planning approval is given, halting fracking until lessons are learned from the rest of the UK, and a "comprehensive review of the baseline conditions" before any planning application is granted. Mr Murphy said: "If I am elected First Minister in 2016 there will be no onshore fracking in Scotland until it has been shown beyond all doubt that it can be carried out safely. "People are rightly concerned about shale gas. They are worried that it will be imposed on their community against their will and without their consent. I will not let that happen. "So the next Scottish Labour Government will give local communities full control over onshore fracking in their area through a local referendum. No development will be able to take place without a majority of local residents endorsing any planning decision." He added: "No application for onshore fracking will even be considered in Scotland until we see what happens in other parts of the UK. I will not let Scotland become a guinea pig for fracking." Scottish Conservative energy spokesman Murdo Fraser said: "This is just desperate scrambling around by Jim Murphy trying to come up with issues which give him political traction. "But it was only last year that all parties came together to help secure the future of the Ineos plant at Grangemouth. "That relies on the supply of shale gas - and simply opposing it will only threaten this vital plant again." But campaign organisations Friends of the Earth (FoE) and WWF welcomed Mr Murphy's pledge. FoE Scotland head of campaigns Mary Church said the "triple-lock" system would stop the shale gas industry in Scotland "for a great many years, if not forever". Ms Church said: "Scottish Labour policy effectively tolls the death knell of the fracking industry before it ever gets off the ground. "Mr Murphy's announcement is a serious challenge to the Scottish Government to get off the fence and act now to stop unconventional gas extraction in Scotland. "Unconventional gas is unsafe, unnecessary and unwanted, the Scottish Government should focus on making the most of our abundant renewable resources instead." WWF Scotland director Lang Banks said: "Scottish Labour are to be congratulated for putting people and our environment ahead of shale gas fracking. It's now time for the Scottish Government to come off the fence and finally rule out the development of shale and other unconventional fossil fuels north of the border. "The climate science is clear, the vast majority of known fossil fuel reserves need to be left in the ground and not burned. Scotland should instead be playing to its natural advantages in clean, green renewable energy." The Scottish Greens said on Friday a petition calling on the UK Government to halt its plans to award fracking licences in Scotland has achieved more than 5,300 signatures since its launch on Monday. Co-convener Patrick Harvie said: "The huge public support we've had for our petition to the Department for Energy and Climate Change (DECC) piles pressure on all the other parties.